Legislation to give local communities the option to place an additional sales tax of up to one cent on the ballot for voter approval will be House Bill 1 – the stated top priority of the House in the 2015 session. In a press conference Friday morning, House Speaker Greg Stumbo, D-Prestonsburg, and Republican House Leader Jeff Hoover of Jamestown announced they will co-sponsor local-option sales tax legislation—also known as LIFT —along with the bill’s 2014 sponsor House Majority Whip Tommy Thompson of Owensboro. 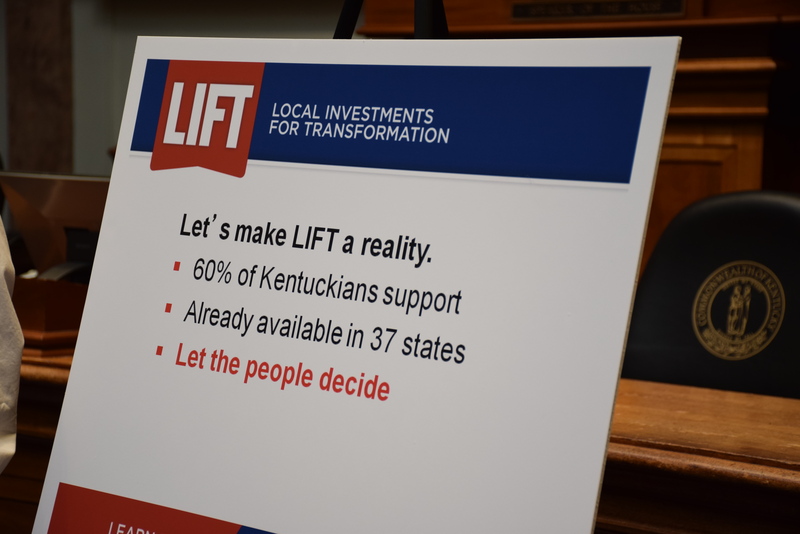 LIFT, an issue supported by the Kentucky Chamber, is a proposal that would allow local governments to use the additional sales tax to pay for to pay for voter approved local investments. When the projects are finished, that tax increase goes away. In his remarks, Hoover noted his ongoing support of the legislation and stated that the idea is not to raise taxes on citizens but rather to give them the opportunity to vote on and pursue local projects. Stumbo, who had been leaning against the idea in the last session before the issue was pushed to the back burner, said Friday he believes the idea makes sense and that the issue has traction this year and they will have a lot of support on the legislation. “We are looking forward to starting the new year and working together on issues like this that we can do in a bipartisan manner,” Stumbo said. After sponsoring the bill in the last session but running into road blocks after his leadership caucus was split on the issue, Thompson said Thursday it is time to pass the legislation. 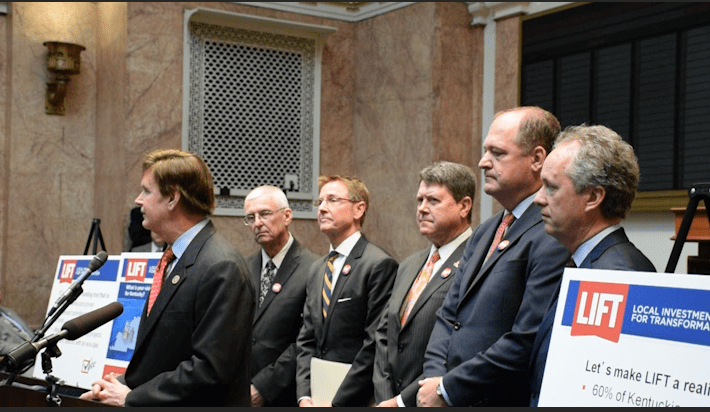 As he discussed the support for the legislation in the House chamber, Stumbo said he has spoken with House Majority Floor Leader Rocky Adkins and Majority Caucus Chair Sannie Overly who both said they will support the legislation in the 2015 session. The House Speaker also said they begin with 16 co-sponsors of the bill and expect more, possibly totaling 40 co-sponsors in the House. The legislation will require a two thirds majority in each chamber to get through as it is a constitutional amendment. The legislative leaders were joined at the announcement by other supporters of the initiative including Louisville Mayor Greg Fischer and Lexington Mayor Jim Gray. The local officials praised the work of the legislators and noted the importance of the issue to their local community. Daviess County Judge-Executive Al Mattingly also spoke at the press conference where he spoke about his time in business and noted that the money collected from a local option tax is then used by the city for the city, rather than the money being sent to Frankfort. “I like the local option sales tax because if Mayor Fischer decides to do a project in Louisville, Owensboro and Daviess County will not be paying for it. If Mayor Gray decides to do a project in Lexington, the citizens of Owensboro will not be paying for their project unless the take the opportunity to visit one of those cities,” Mattingly said.